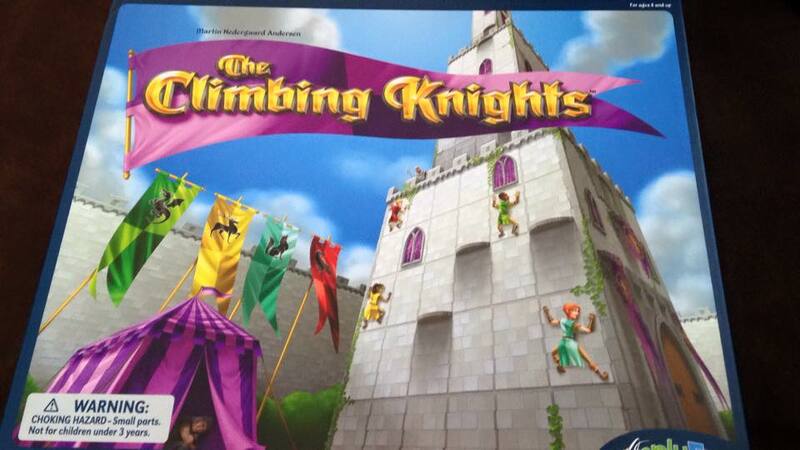 I’m reviewing The Climbing Knights, one of four of SimplyFun new releases. We love games in our house! We’ve got one set up in the dining room right now that took us too long to finish on Monday night, so we “paused” it until we have another free evening. (Hint: put a quarter under the piece of the player who goes next!) Because of our love of games, I was definitely happy to be asked to review The Climbing Knights game from SimplyFun. What’s especially fun about The Climbing Knights game is that it’s 3D. Rather than being a flat board-style game, this game board goes up! What’s really great about this style of game is that it’s incredibly engaging. We set the game up in our family room on the coffee table and forgot to take it down before having a few friends over, and the kids were immediately drawn to the game and wanted to know what it was and how to play. This game is for ages 8 and up. It takes about 30 minutes to play and is for 2-4 players (because there’s only four knights). To win, your knight needs to climb the tower twice to retrieve “banners” and then slide back down. Guards can stop you from reaching the top, so watch out! The game isn’t hard to assemble- although helpful hint, you’ll want to turn the pieces to line up with the slots (it’s really obvious if you’re not 12 and just trying to jam it together in a hurry!) in the correct way. 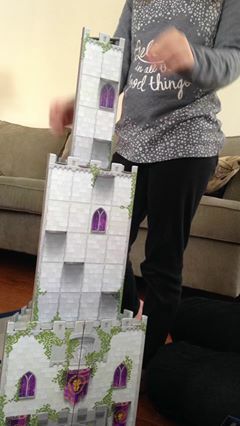 It took us all of a minute to assemble the castle. Playing this game isn’t really all that complicated. You could actually play with much younger children if you wanted to remove one of the guards. What makes it complicated is the strategy portion- where can you move so that you don’t get sent back down to the bottom. It’s not quite chess-level strategy, but your children will quickly learn to think ahead a few moves and consider where the guards will be if they get the maximum number of moves each turn versus if they’re sleeping each turn. 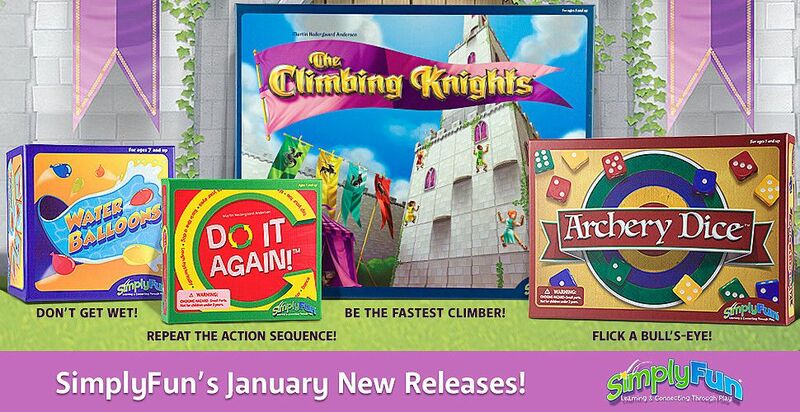 In addition to the Climbing Knights, SimplyFun has several other games that you and your children might enjoy playing. These are some of their newest releases! We enjoyed this fun, 3D game and both my 8 and 10 year old think your kids will really love it, too! My 12 year old enjoyed playing with his siblings, but he can win the game in about 14 seconds, so we all think it’s a little too easy for him. Check out the full SimplyFun line and plan a family game night today! I was one of several reviewers for The Climbing Knights, and there were also families that tried out Archery Dice. Click the link below to see what others thought about these fun, thought-involved games!